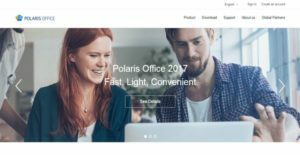 What is Polaris Office 2017? Polaris Office 2017 is a fast, light, and convenient set of office software solutions which can be used for business, public, educational, and personal purposes. The office suite is built and developed by Infraware, a Korean-based global software provider that has been delivering fresh and innovative experiences to millions of office application users from 240 countries around the world. Polaris Office, furthermore, aims to help organizations, businesses, and institutions optimize and transform their work environment, reduce costs, meet customer needs, and enhance productivity and mobility. It provides them with the capability to create documents in a variety of formats such as Microsoft Office, PDF, ODF, and TXT; and the opportunity to interact and communicate with their team members so that they can share ideas and maximize business performance. The office suite is equipped with a PDF converter that enables users to convert PDF documents to Word, Sheet, or Slide documents. Using this tool, they can also convert files to PDF documents. Polaris Office can accommodate multiple work environments, platforms, and devices. As a result, documents can be viewed and edited on any Windows PC, Mac computer, and Android or iOS device on the fly. It provides tools that permit team members to easily work on documents that require collaboration. Multiple users can access a single document in real time and work on it simultaneously, wherein contents edited by each user are saved automatically. Polaris Office also ensures that corporate documents are secured and protected from any possibility of data leakage and data breach. Polaris Office delivers a highly compatible word processing tool that permits users to create and edit documents in different formats. Thus, they will be able to convert Microsoft documents to PDF documents or vice versa and edit them to produce outstanding outputs. They can even convert PDF documents that can’t be edited to Microsoft Office documents and edit the converted documents conveniently. The word processing solution has a presentation mode feature which allows the effortless conversion of Word documents to presentation documents. This provides a hassle-free experience to users, as they are able to come up with presentations instantly. The solution also supports dual interface which enables users to modify the arrangement of toolbar icons and functions found within the ribbon interface. In addition, it utilizes a lot of Microsoft Word shortcuts, letting them access convenient keys and functions that are familiar to them. Polaris Office is built with a spreadsheet program that provides powerful features that assist number crunchers and database administrators in performing data analysis easily and accurately. Through the aid of its over 300 functions, they will be able to edit data and check errors in their data in less time. In addition, the program has pivot tables which make it easy for users to summarize and analyze large quantities of data. Another feature available in the program is the capability to filter and sort data within documents intelligently. It ensures that users are able to visualize and present their data efficiently. Thus, the spreadsheet program comes with various charts and sparklines so that they will be able to gain insights into their data at a glance. The office suite gives users the ability to come up with effective presentations. It offers a presentation tool that is equipped with optimal functions and effects. As an example, users can take advantage of its smart guides so they can neatly arrange and line up the objects they are inserting to their presentations such as images, shapes, and tables. To enhance their presentations, the tool permits users to create presentations with rich media content which includes videos, audio, images, and even hyperlinks. Also, they can apply animation effects and transitions to documents. The presentation program has tools that help users deliver their presentations in various ways. For instance, they can configure its slideshow settings so they can efficiently define and customize how slideshows are presented to their audience. Polaris Office delivers a PDF converter that comes with efficient and powerful features. With this solution, users will be able to access and open PDF documents and view them in their original layouts. It allows them to convert office documents to PDF documents or vice versa, wherein they can edit the converted documents conveniently. If users want to search for specific keywords contained in a PDF document, the solution enables them to do that very quickly. Alneedneryeed to do is to enter the specific keyword and the solution lets them instantly jump to the area where such keyword is found. Document security is among the reliable and powerful features offered by Polaris Office. This feature is very important so that corporate documents, files, and folders are guarded against unauthorized access, preventing data breaches and data leakages. With Polaris Office, users will be able to secure and protect any personal or confidential information included in a document like phone numbers, resident registration numbers, addresses, and bank account details. When it comes to protecting data in spreadsheets, they have the option to secure either the entire spreadsheet document or just a selected range of sheets. They can also specify who among their team members can access and edit data and contents within spreadsheet documents by granting and controlling editing rights. If you are interested in Polaris Office 2017 it might also be sensible to investigate other subcategories of Best Office Software collected in our database of B2B software reviews. Since each company has unique business needs, it is advisable for them to desist from looking for a one-size-fits-all ideal software application. Needless to say, it would be futile to try to find such an app even among widely used software applications. The clever thing to do would be to catalog the various vital factors that require consideration such as key features, budget, skill levels of workers, company size etc. Then, you should do your research thoroughly. Read some Polaris Office 2017 reviews and check out each of the other solutions in your shortlist in detail. Such comprehensive research can make sure you discard ill-fitting systems and choose the app that presents all the elements you require for business success. How Much Does Polaris Office 2017 Cost? We realize that when you make a decision to buy Office Software it’s important not only to see how experts evaluate it in their reviews, but also to find out if the real people and companies that buy it are actually satisfied with the product. That’s why we’ve created our behavior-based Customer Satisfaction Algorithm™ that gathers customer reviews, comments and Polaris Office 2017 reviews across a wide range of social media sites. The data is then presented in an easy to digest form showing how many people had positive and negative experience with Polaris Office 2017. With that information at hand you should be equipped to make an informed buying decision that you won’t regret. What are Polaris Office 2017 pricing details? What integrations are available for Polaris Office 2017? If you need more information about Polaris Office 2017 or you simply have a question let us know what you need and we’ll forward your request directly to the vendor.